Do you want free healthy groceries? 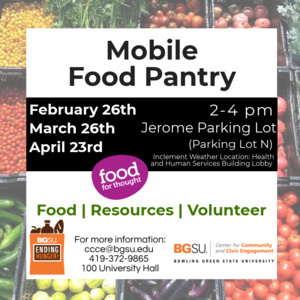 BGSU Ending Hunger, in conjunction with The Center for Community and Civic Engagement, are bringing the Food for Thought mobile food pantry to campus in efforts to alleviate some of the financial burdens that students are facing. The pantry is open to any student, staff, faculty, or community members. There are no requirements except wanting free healthy food! For more information email ccce@bgsu.edu or call 419-372-9865! Hope to see you there! We also offer volunteer opportunities the day of and the day before each pantry! Follow this link to signup as a volunteer or contact us at ccce@bgsu.edu.